KENNEDY SPACE CENTER, FL--Engineers inspecting the shuttle Discovery's external tank have found a fourth crack in the structural ribs, or stringers, making up the outer skin of the compartment between the liquid oxygen and hydrogen sections. Analysts are discussing techniques for making sure even more cracks are not present under the tank's foam insulation while work to repair the initial cracks proceeds. Discovery was grounded Nov. 5 when sensors detected a gaseous hydrogen leak in a 7-inch vent arm quick-disconnect fitting attached to the side of the external tank. Launch was delayed until at least Nov. 30, the opening of the year's final shuttle launch window. Monday afternoon, engineers were cleared to install a replacement vent line quick-disconnect fitting after extensive measurements revealed two areas where the original hardware was not sufficiently concentric, or aligned, creating a possible leak path under cryogenic conditions. A replacement ground umbilical carrier plate, or GUCP, already has been installed on the tank and measurements show its alignment is near perfect. The replacement quick-disconnect fitting will be oriented, or "clocked," to ensure the best possible circular alignment, or concentricity, and the tightest possible seal. NASA managers have not yet made an official decision on whether to order a tanking test, pumping liquid hydrogen back aboard o make sure the replacement hardware is leak free. If the test is required, it likely would be carried out at the start of an extended launch countdown, assuming the foam repairs can be completed in time. The cracks are believed to have occurred about an hour after supercold propellants began flowing into Discovery's external tank for the Nov. 5 launch attempt. Engineers first spotted a large crack in the foam insulation near the top of the intertank section. When the foam in the area was cut away for repairs, engineers found two 9-inch cracks in the flat attachment plates on either side of an underlying stringer known as S-7-2. NASA managers then decided to cut away additional foam and a third crack was found Friday on the stringer to the immediate left of the one that was initially discovered. Over the weekend, a fourth crack was found in the left-side stringer, known as S-6-2, sources said. No cracks were found in stringers on the right side. To fix the initial cracks, engineers decided to cut out the damaged section and to bolt in a replacement, along with an additional brace called a doubler to provide more strength. Presumably, the same repair can be used to fix the second stringer. External tank crack repairs are not unusual. Some 29 stringer cracks were found in 18 previous tanks, according to an official familiar with their history. Four have now been found in Discovery's tank, ET-137, and three were found in a tank scheduled for use by the shuttle Atlantis next summer, ET-138. Doublers were used in 23 repairs. Engineers suspect the use of a lightweight aluminum-lithium alloy in the tanks may be contributing to the crack problem. 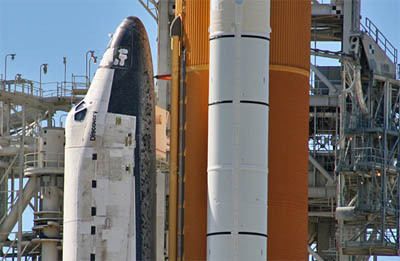 While crack repairs are not unusual, the cracks in Discovery's tank are the first to be found at the launch pad, where access is more difficult. An environmental enclosure has been erected around the known damage site to facilitate repairs and the eventual application of fresh foam insulation. It's not yet known whether more defects remain to be discovered, but engineers are optimistic high-tech instruments capable of detecting damage beneath the foam can be used to find any additional problems.